The Charlie’s airhead fly was designed to fill a huge gap in my fly arsenal. The gap that almost all other fly fishers and fly tiers often grimace about when they see a conventional fisherman doing well in the boat next to them with a bait that is large and moves a lot of water during it’s retrieve. The driving force behind the airhead was to create size while still making a castable fly. I had been fishing the turbid waters of some of our local Northern California rivers for striped bass, using flies I had tied employing conventional tying methods and with combinations of both natural and synthetic materials. In order to create enough bulk in the fly for it to be noticed in 8 to 12 “of visibility they quickly became like a drenched sweat-shirt and too hard to cast for me and my fishing partners. I was at a crossroads with a serious need to get something that worked better. I started to play with different means and methods and arrived at the idea of the airhead. I wanted to create a hollow head that was nearly weightless and that could be shaped to be aerodynamic and hopefully provide some erratic action when retrieved. After much R&D and many a failed effort, I came to understand what was required to make it work. What was missing was a way to form the head. I tried silicone, sof tex, etc but could not find anything that did all that I needed. Some materials were too rigid, some too soft some were too heavy. I was buying my sons football cleats at Big 5 Sporting goods and on the rack across from where I was sitting was a display that included shoe goo.The final piece of the puzzle had been found and the airhead was off and running. Once the mechanics of the fly were complete and I could make the fly the same each time, it was time to test it. Going back to those same Nor Cal rivers the following season was a much different experience. Me and several of my close friends were having amazing results in the very turbid waters that had frustrated us previously. 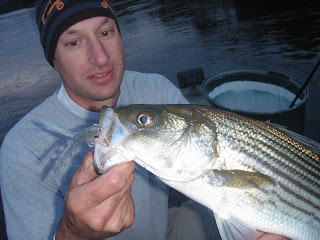 Many trophy stripers, in excess of 20 pounds were brought to hand and our confidence in the fly gained momentum. It was now time to test it on the world stage, so off it went to Australia, Baja, the Amazon, Christmas Island, etc. The results were staggering. Many trophy fish were caught by the folks that I asked to field test for me. Now, the airhead has really started to take off and is well known at many fishing destinations as the “go to” fly. In terms of how to rig the fly, it should be tied on with a traditional loop knot so as to give the fly the very best opportunity to dart away from a straight line retrieve during the pauses of your stripping cadence. A loop knot gives the micro currents in the water the opportunity to change the fly’s direction as they contact the round portion of the head. Once the direction of the head is changed the momentum of the fly will have it travel that direction until you strip your line again. Sharp hard strips followed by long pauses can be a very effective way to retrieve the Airhead when water temps are down and fish are not interested in a high speed chase. One of the wonderful aspects of the airhead is that it can be very effectively fished at all depths in the water column depending on the chosen line. Starting at the top of the water column, with a Rio, outbound short floating line, I really like to use a longer leader and strip and pause the fly in shallow water. It will not stay afloat but will be working just at or under the surface based on the speed of your retrieve. This is spectacular as you get most of the visual treats of top water fishing , with a much better strike to hook up ratio as the fly is surrounded by water and does not get knocked away like some traditional “high floating” top water flies. Again, a loop knot is key and will allow optimal movement. Although Umpqua’s production models do not come with weed guards they are simple to add by wrapping hard mason on the hook shank and poking the line into the head where desired and securing with goop. Fishing 1 to 3 feet below the surface of the water is accomplished with an intermediate line. Again, the Rio outbound short Intermediate line is my choice to fish these depths. Your rate of retrieve can and will need to vary based on the mood and species of fish and the time of the year. I usually experiment with different retrieves until I find what they want on a given day. I also use this set up to fish very slowly in 8 to 10 feet of water when winter water temperatures plummet to the mid to high 40’s.It allows you to dance the fly in the fishes face making it too hard to resist. My personal best Large Mouthed Bass of 8 plus pounds was caught utilizing this method in mid 40 degree water. Patience seems to be needed in large supply to fish this way effectively. If the need is to fish 3 to 8 feet with a medium to fast retrieve then a type three Rio outbound line is my choice. If I am fishing much below 8 feet or so then the Rio T-11, T-14 integrated shooting heads are what I reach for. 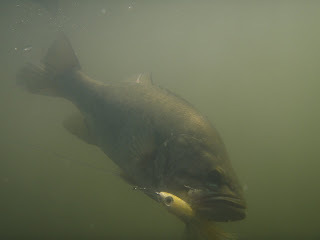 If the goal is to get the fly down deep, then it is imperative that you give a quick strip when the fly hits the water. It is critical that the fly get pulled under the top of the water to release the air pocket that can sometimes get trapped in the head of the fly. Once the air is out of head of the fly it will sink very rapidly allowing effective fishing to be accomplished at depths of up to 30 feet. I am thrilled that all the appropriate and proven colors and sizes are now in production at Umpqua. There is not a predatory fish swimming that one of the many sizes and colors of airheads won’t readily catch. Good luck with the fly and be sure to take a few photos so that I can feel like we fished together. You'll learn a lot about fishing this awesome fishery by checking out this blog and even more if you book a day on the water with Kevin sometime. We highly recommend it.